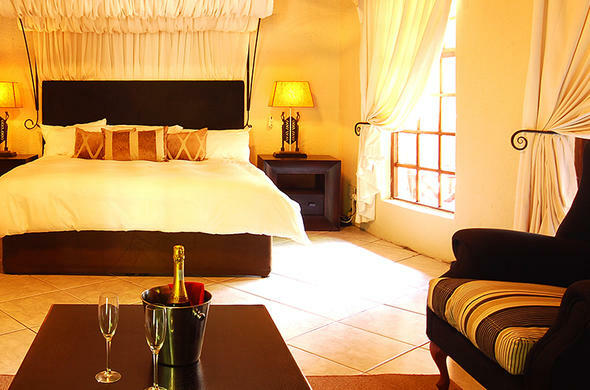 Umbhaba Country Lodge provides guests with luxury Mpumalanga country lodge accommodation in elegant suites. Umbhaba Country Lodge boasts 30 luxury lodges, each decorated in an individual style. Most of the suites feature open log fireplaces. The suites are surrounded by the lush sub-tropical gardens and the sound of waterfalls. Each suite also features individual temperature control. This Mpumalanga country lodge accommodation features 10 spacious family suites. Each suite is fitted with a king size bed and 2 three quarter beds. The bathroom features a large oval bath, a spacious shower and granite tops. The family suites also boast their own private patios. This suite at Umbhaba Country Lodge sprawls over three levels and offers a romantic Jacuzzi, mini bar and en suite bathroom. Guest can enjoy a sundowner or just relax at the private patio. Embrace the abundance of bird and animal life after a day of game viewing in Kruger National Park. These suites boast separate lounges and spacious bedrooms with fireplaces on either side. The bedrooms are fitted with romantic four poster beds. The en-suite bathroom is fitted with a twin shower and a sunken window bath from where you can enjoy the spectacular sunset over the Sabie Valley. The Tusker Suites are decorated to reflect the history of the amazing elephants found in the Kruger National Park, South Africa. The en-suite bathroom is fitted with sunken corner baths. Enjoy the sound of the surrounding water features from the privacy of your own patio.